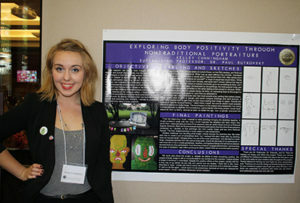 Three Department of Art Students received awards through the Center for Undergraduate Research and Academic Engagement. Emil McCullers Kelly received the Scott and Ina McNichols Undergraduate Research Award, Kelly Cunningham received one of the Phi Eta Sigma Undergraduate Research Awards, and Gabriela Fulginiti received on the of Public Service Research Fellowship Awards! Emily McCullers Kelly, a local to the Tallahassee area, is entering into her second year of the B.A. in Studio Art and is working towards completing the prerequisites for the Master’s in Art Education Program. She aspires to be accepted into the limited access B.F.A. Studio Art program this semester. Emily enjoys the process of collecting data and using art as a medium through which to express her findings. She looks forward to a career in engaging children to think critically about how to express ideas through the process of creating art. Named for Scott (B.S., 1996) and Ina (B.S., 1996). McNichols. Mr. McNichols is the President of the McNICHOLS Company which is North America’s leading supplier and fabricator of perforated metal, expanded metal, wire mesh, architectural metals and a variety of gratings products. Kelley Cunningham, originally from Seattle, Washington, is a BFA Studio Art and Creative Writing major. Last year, she conducted research on Dolly Parton and the gendering of country music with Dr. Leigh Edwards through UROP, and she is currently a UROP leader. In the future, she would like to continue combining body image research with creative endeavors and hopes to find a career creating feminist-friendly cartoons or comics. Gabriela Fulginiti is in her senior year pursuing a dual degree in Studio Art and International Affairs, with a minor in Entrepreneurship. 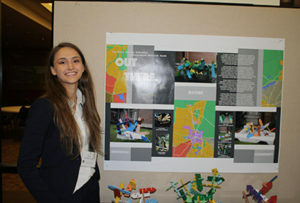 She worked with Professor Holly Hanessian on an artistic research project in 3D ceramic printing through the Undergraduate Research Opportunities Program (UROP). She received the Ranck International Study Award to spend 7 weeks immersed in Hindi study. 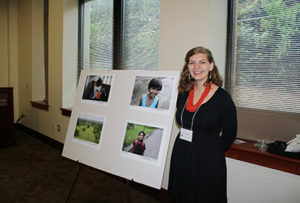 This summer’s research project was born out of two previous trips to India, where she was volunteer teaching English. After graduation, she plans to teach English abroad for a few years before getting her masters degree in International Education. These awards are funded by the Atlantic Coast Conference (ACC) and the Garnet and Gold Scholars Society . The Public Service Research Fellowship (PSRF) offers undergraduates fellowships to engage in research that directly benefits community-based organizations, programs, and/or specific community groups in a domestic or international setting.